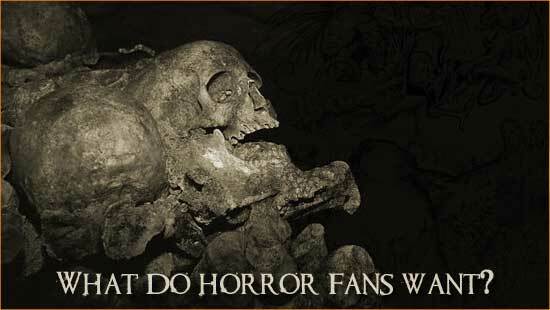 I’ve been asking myself this for quite some time: what horror fans want? Being a horror fan and especially a webmaster, it’s a must. You want to ensure that your website offers unique content, but if you’re running a general horror website, it must also cater to all types of horror because I’ve learned that there are not two horror fans that are exactly alike. Unfortunately, I’ve never been able to come up with a definitive answer to that question. Everyone is different and everyone has a different opinion. For instance, you may talk to a die hard gore fan and ask them what their favorite horror movie is and they will respond promptly with “Frailty”. Likewise, you might talk with a person that is an 80?s horror fan and their favorite horror movie may be “Paranormal Activity”. Some of the answers I have received to this question have, needless to say, been shocking. So, you asked me a seemingly simple question and this is what you get back. Disappointed? Probably. But, it’s a tough question to be answered. There are so many different things offered in the world of horror that you may love different movies for their different qualities. Maybe the story was great, the acting was excellent, or the gore held your attention. Hell, maybe it’s a mix of these things. Each horror movie has something different to offer and you may love it or hate it, but you still watch it and I think that could be where you find your answer. Ultimately, I think horror fans just simply want more horror. Whether it’s good or bad, it gives them something to watch and something to talk about, or ponder over in their own minds. I remember when I was younger; I would watch television and become excited when I would see a trailer for an upcoming horror movie. Whether it was original, a blood-fest, a remake, a sequel, or anything as long as it was a horror movie, it excited me to know that soon I would be watching a new horror movie. Even if I didn’t get to catch the movie in theaters, I would most assuredly check it out when it became available on DVD. So, what do I want as a horror fan? I want horror. I want all the horror you can give me and I think that’s what all of us horror fans want. We want more horror movies to watch, more horror movies to discuss and more horror movies to fall in love with. Bojangles is the webmaster for Horror Trailer.com and Talk Horror.com. CategoriesOpinion TagsBojangles, What do horror fans want?